01 Jul 16. Sometimes I think we get so caught up in things that we miss much that is all around us. Many members of the camera clubs I either belong to or have belonged to are ardent birders and have lenses that allow them to capture birds at great distances that they wouldn't be able to do with a decent image size without. The lenses cost in the tens of thousands of dollars and are truly works of art in themselves, but one has to be a very serious bird photographer in my mind to justify such cost. Of course these lenses can be used for other forms of wildlife, but I see them most often on the cameras of birders. Every time we go out to shoot birds, such as eagles, Jan is always telling me I should get one but I never have and never will. Since I don't sell any of my work, I simply can't justify such expense. But one does not have to go after the far away critters to get some grate bird pictures. Literally all around us one can folks who raise chickens which come in an amazing variety of colors. If Jan gets her way we will also be numbered in that group some day. One really doesn't appreciate just how beautiful these birds can be unless you spend some time at the local fairs, raise them yourself, or visit with someone who keeps them. Since they are basically farm animals, getting close to them requires nothing more than sitting still and letting them come to you. With nothing more expensive than a normal lens, the kind that comes with every camera, you can get some wonderful photos. 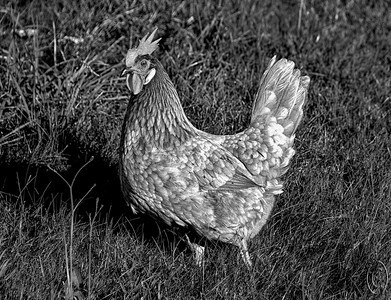 For today you get one in B&W to just illustrate the stature of the birds. I'll share another later in color that will show off just how spectacular they can be! The base image was cropped a little, given a small amount of micro contrast enhancement on the feathers, and converted to B&W. Nikon D300s; 18 - 200; Aperture Priority; ISO 200; 1/400 sec @ f / 9. 05 Jul 16. I sent no image for the 4th; hope all of you had a GREAT Independence Day celebration. My cousin and his family put on a real bash each year on their waterfront property with way too much food, far too many folks for me, and fireworks. I generally visit prior to the gathering and occasionally later for the fireworks. My early visit on the 4th gave me an opportunity to take a few shots of some bottles, not unlike something I did about 5 years ago. 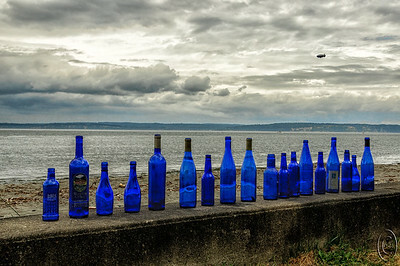 My cousin's wife collects blue things and in particular she collects cobalt blue bottles and then lines them up on the seawall in front of their home. The last time I shot them I had some nice grasses to play with and some sunshine; this time around I had clouds and a blimp, the Goodyear blimp to be exact. Plus a different set of blue bottles the prior ones having bit the dust (sand) over the past few years. So two very different photos presenting two very different moods. Now I need one with the bottles in snow. If you have any blue bottles you don't want I'm rather certain she would love to get them. The base image was given a little contrast enhancement and then I adjusted the brightness of the bottles and the rest of the image individually. Nikon D300s; 18 - 200; Aperture Priority; ISO 200; 1/640 sec @ f /10. 06 Jul 16. 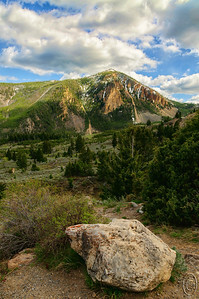 About 7 miles south of Mammoth Hot springs you pass by Bunsen Peak, the site of one of the 1988 fires. That year, '88, received only 32% of the normal rainfall and the fires burned roughly 794K A. At the time there were some dire comments made about how devastating the fires were. Not unlike the comments about the Mt St Helens eruption. As usual the tree huggers didn't have a clue and Yellowstone, like St Helens, came roaring back with full force. Folks we know who visited Yellowstone in '89 said they had never seen such a profusion of flowers as was also noted in an issue of Audubon Magazine that year. Same held true for the sides of Mt St Helens,. Now almost 3 decades later the area of the Bunsen burn is a lush green and you would be hard pressed to exactly locate the burn area. I wasn't even aware of it until I read the roadside signs. It always amazes me at how fast the flora, as well as the fauna, return after being provided with a wealth of minerals and lots of energy (sunshine) following any of these natural "disasters." When visiting any of the parks I often find it interesting to read the signage provided at "disaster" locations to get an idea of how the current "caretakers" perceive the cycle of life that the parks so fully represent. Sometimes it seems as though the text on the signs represent the current political thinking at the time they were placed as opposed to solid science. The base image received some small amount of micro contrast enhancement for the sky, and was then given a slight warming to offset the very cool light on the afternoon I took the shot. Nikon D300s; 18 - 200; Aperture Priority; ISO 200; 1/250 sec @ f /10. 08 Jul 16. Last evening Jan brought over her i-pad to show me a video of a small rodent - I think it was a rat, she thinks it was a mouse - whose baby had been grabbed by a snake, likely a Garter Snake or something similar, that was crawling off with the baby in its mouth, still alive. The mother rodent was viciously attacking the snake by chomping on its tail as it was trying to slither away to safety. Not to be the case as the snake eventually drops the infant, and tries to get away with its dignity intact but the rodent was not about to let that happen and continues to chase the snake into the woods still attacking it. Eventually mamma returns, picks up the baby in her mouth, and scurries off. Quite a show. 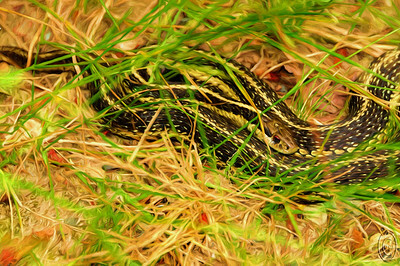 This morning as we left the house and started on our morning walk with the girls, I spotted a young Garter Snake loosely coiled in front of our wood pile. Handing my leash to Jan I got the camera and took several shots of the critter before switching leashes with Jan so she could get a close up look and then "encourage" it to move to a safer location under the woodpile. When we got back from the walk the critter was once again resting in the same place where we originally saw it so I took a few more shots of it. Apparently the location in which it was resting provided a good opportunity for a meal. Now if I could only get Squeezer to provide for himself like that it would be great. Julius (Squeezer - our Ball Python) is now 21 and her Bearded Dragon Will is now 12 years old with an expected life-span of 6 years. I doubt that the critter I photographed will be so fortunate. Thought I'd best rate this as an "R" image (Reptile) as I know there are a few folks who don't appreciate reptiles as we do. I took the base image and after adjusting for best color, ran a filter against it to get a painterly look, that of an oil painting created using a palette knife as opposed to a brush. Nikon D300s; 18 - 200; Aperture Priority; ISO 200; 1/60 sec @ f / 5.6 with fill flash. 12 Jul 16. Back in the end of April time frame I shared this image with you in the form of a simple outline. A very simple outline to be exact. With the cherubs with us now for the majority of the summer, I printed out for them a "coloring book" of these outline type images of what I've sent daily for them to color using their imaginations as to how the "final" picture should look. They don't get to use my images as a guide, so it should be interesting to see what they come up with as the final result of each. While I was going through the process of selecting each one and printing it out, I was also looking at all the the B&W versions I had made and not shared. The one for today I thought made a nice complement to the previous April offering. This time the grasses are mostly although not completely in silhouette and are hopefully balanced by the brighter remaining portion of the scene. This was taken in late afternoon light with some rather stormy weather threatening to ruin our drive home as you might discern from the clouds in the photo. I first took the base image into a RAW editor and shifted the black B&W to create the silhouette and then into a B&W plug-in to finish it off. Nikon D300s; 18 - 200' Aperture Priority; ISO 200; 1/640 sec @ f /11. 11 Jul 16. For those of you who read this daily chatter as opposed to those who just look at the images, you may recall that I've written several times about our residing in a major convergence zone and that our weather is for the most part controlled by the two meshing weather patterns. Writing about it is one thing, but being able to provide images of how things look (work) is another.The upper cloud layer (blue and white) has moved up from the southern end of Puget Sound while the lower one (dark blue gray) is moving in from the west (Pacific Ocean) via the Straights of Juan deFuca. They meet here and commence battle. Sometimes the resultant jousting is most impressive, at other times it is quite peaceful like what you see in the photo. Either way it can be spectacularly beautiful and often lasting for hours. So if clouds are your interest, and you don't reside in the southern part of our nation, this might be the perfect location for you. To the base Image I added a wee bit of micro contrast enhancement and that was it. Nikon D300s; 18 - 200; Aperture Priority; ISO 200; 1/800 sec @ f / 9. 13 Jul 16. On a very foggy January morning we made our way to Fir Island to see what we might accomplish bird-in-fog wise. For the majority of the morning all we had was fog, but as noon approached it began to lift and for the better part of 2 hours we had some great shooting. Apparently not everyone who fancies themselves as bird photographers agreed with us as we were virtually the only ones around. No complaint when that happens as there is no one to disturb the activity in any way. This shot was taken as the fog was just departing enough for the hunters to disturb the hunted and they made an initial lift off, did their circling flight path maneuver, and at this point were returning to base. 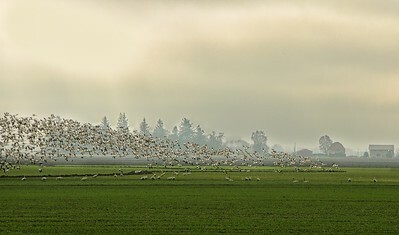 It was a rather unique sight for me as this was a case of the Snow Geese taking flight to avoid being the daily fare while their larger field mates, the Trumpeter Swans merely sat out the entire exercise. If you don't recognize the different birds, the Snow Geese are still in flight in varying degrees while the Trumpeter Swans are on the ground eating. The swans are also identifiable by both their longer necks and much larger bodies. This is a straight shot having only been given some small amount of cropping for visual impact. Nikon D300s; 18 - 200; Aperture Priority; ISO 200; 1/500 sec @ f /10. 14 Jul 16. It being Theatrical Thursday it's my day to go crazy so I thought I would. Well, not real crazy, just a little. The weekend we were looking for stuff for the pond I took photos of just about every pond flower I thought worth a shot, and this water lily was one of those even though it was just one plant floating in a small tub. Had to maneuver a bit to get just the flower, but with a little bending here and arching there I was able to get mostly just the plant and not too much other junk. I've removed everything from the image that wasn't obviously part of the plant and forced it to black. 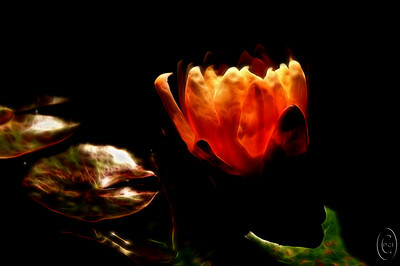 The flower was back lit so all I really did other then remove the debris was to strengthen the back lighting. One could perform a very severe cropping and leave just the back lit blossom for a real dramatic shot. You might give it a go to see what you think. The narrative describes everything I did so nothing more to add. Nikon D300s; 18 - 200; Aperture Priority; ISO 200; 1/1250 sec @ f / 7.1. 20 Jul 16. Last Thursday while cleaning up the email stored on this box winderz suddenly decided that one of my drives had a small glitch that it needed to fix and proceeded to run - un-commanded - the chkdsk utility. Should have known better than to let that happen. When it finished it said that it had found some cross linked files, had fixed everything, and all was well. Only it wasn't all well, the utility had wiped out the MBR and its backup, and the drive, the one holding all my mail, was toast!!! Spent the last 6 days trying every trick I know plus those of a few others to no avail in recovering it. Not willing to spend between $500 & $5,000 for a professional data recovery, I've given up and have restored as much as possible form my backups. Only problem is that I did not realize that the backups didn't/don't backup the mail stored in sub folders, or, if it should, it didn't. So now I'm starting over basically from scratch. The address books are stored in 5 different places, so at least those are intact. For those of you who have indicated that certain images were worthy of being used for the annual calendar, please resend those mailings as I have none of them any longer. All this to say sorry for the lapse in the mailings. Believe me, I wish it wasn't the case. The image for today is another from Valley Nursery of pottery they have stacked up in one section of the non-plant display area. These are apparently locally made although I don't know by whom. 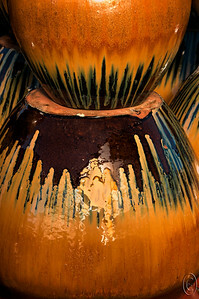 I like the glazing on them and find it fun to try and capture the subtleties of color of the glazes. This was a couplet of blue and green stripes, green atop of blue.The sun was shining on a part of one of the jar and looked a great deal as if it had been focused by a lens to affect just one small portion of the jar. I could have removed that by using a diffused flash light source but I didn't have a diffuser with me to use with the camera flash so I decided to just let it show to illustrate the effect of a point light source. Not a perfect example perhaps but I think it serves the purpose. This is the type of material that serves well for creating interesting creative images. The base image was cropped for a tight composition and then I applied a small amount of burning to diminish the areas where the bright portions of the jar were virtually blown out. Nikon D300s; 18 - 200; Aperture Priority; ISO 200; 1/640 sec @ f /10. 21 Jul 16. It being the creative time of the week I'm sharing with you just such an image captured a couple days ago among our pond decorative plants. Those of you close to my age may well remember a game we played when kids called "Red Light, Green Light". We used to play it on our neighbors bank in their back yard and I shudder to think of how many hours we racked up playing it. When I saw this plant, Abultilon megapotmicum, two weeks back I both immediately thought of that game and knew I needed them in the pond area. Right now the plants we have are perhaps 18 inches in height, but they can grow large in our climatic zone, so we'll need to keep them carefully pruned so they don't take over. The colors you see are accurate but of course the amount of detail is the creative aspect. They really are as pretty as the image portrays them and according to what I read about them we should be enjoying both their flowers and attraction of humming birds until the first frost of fall. If we can grow them the way I'm hoping we just might be able to rid ourselves of the twice daily task of filling our several hummingbird feeders. The base image was severely cropped, a few distractions removed, then run through a creative filter, Topaz Glow. 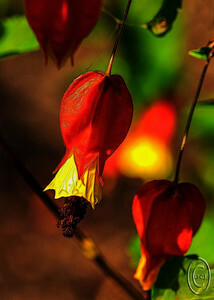 Nikon D300s; 105 macro; Aperture Priority; ISO 200; 1/500 sec @ f / 7.1. 22 Jul 16. For those of you on this list who don't know my beginning in photography, my initial foray into this subject was in the area of macro photography. Other than my daughter, only three members on these lists knew me decades before I began these mailings and I met them all during our first tour in the military in Warminister, PA . One, who was my first Division Officer once claimed that I was the only guy he knew that would go to Europe and come back with 500 pictures of GRASS! Another was my wife's best friend who I think spent as much time in our kitchen as she did in hers, and who frequently states whenever I show a true macro "that's a real dave picture." And the third was our minister who also spent a lot of time in our home. He I met in the BOQ bar my first night of that posting. The first is also an avid photographer, the second an accomplished painter, and the third now just apparently enjoys art. My love of the macro world has never abated as you may discern from the fact that one of the regulars mailings is Macro Friday. Over the last several years I have been thinking about returning to the world of macro to a much greater degree, and have been following the work of two photographers in particular, Harold Davis and Kathleen Clemons. Both of their styles offer something I'd like to add to the material I create and for today I'm sharing the first image I've attempted using a technique taught by MS Clemons. Kathleen's work is on the soft side emphasizing color, shape, or both and virtually nothing she creates is in sharp focus. She uses different approaches in her work one of which is camera motion to create a blur that looks a lot like the original but tends to accentuate form over detail. This is something that you likely will either really appreciate or truly dislike. I plan to spend a great deal of time over the next several months/years trying to develop a style somewhere in-between the styles of these two photographers. 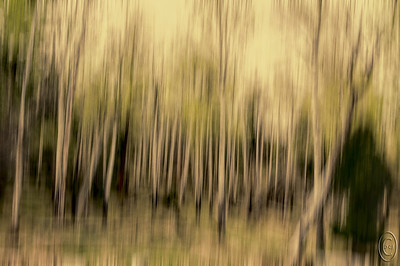 The shot for today is of a stand of white birches just outside of Mammoth Hot springs. I should have used camera motion to create the blur but since I didn't I created in it software. I then added a texture to get the final look. If you take a close look at the bottom right hand corner, I think you'll have to agree that Sasquatch is indeed alive and well. The base image was initially given a vertical motion blur, and then a texture was layered on top. Nikon D300s; 18 - 200; Aperture priority; ISO 200; 1/160 sec @ f /10. Hope you enjoy, dave. 25 Jul 16. Page 3 (with apologies to Mr Harvey.) I was, shall we say, reminded Friday morning, that there are folks on these distribution lists who knew me way before the three individuals I mentioned knew me and that is so true. When I was writing last Friday's babble I was addressing a small group who were among the first to be annoyed on a regular basis with photos I had taken and I wasn't thinking about others whom I've know for a much longer time, one from childhood in addition to my sister, as well as some who I met between school and active duty but none of whom had to put up with my photo habit. So to all of those others I wasn't ignoring you, just not addressing that period in my life. If you keep track of our annual repeat ventures, you may have noticed I haven't shared anything from the Lavender Festival we attend each July because it somehow got away from us this year. Last Sunday a member in our church mentioned to Jan that they had attempted to go to it but spent most of their day stuck in traffic and as such saw only 1 farm before returning home. When Jan shared that I was dumbfounded thinking the festival was a week away. It wasn't! But I figured that we could go later and still get some nice images before the lavender was harvested, so last Thursday we took a chance and ventured over to Sequim to see what might be available. Lavender wise we weren't disappointed but I was sorely disappointed poppy wise as the farm that has a beautiful display of poppies didn't, just pods, and those were much fewer in number than in the past several years. One farm however provided enough material to keep us occupied for a couple of hours so it alone made the trip worthwhile. The image for today is from that farm, Purple Haze, which in addition to a vast amount of lavender also serves up a bed of sunflowers, lots of small poppies, and a flower garden that offers much to delight the lens. For those of you where we live who haven't visited Sequim for the annual Lavender festival, let me suggest going the Thursday prior or a couple days after. You miss the crowds, the charges for the visits, and get the fields somewhat to yourselves, and the owners are just as happy to separate you from your wallets on the non-festival days as they are on the festival days. And if you only have time for 1 farm, I strongly recommend it be Purple Haze. 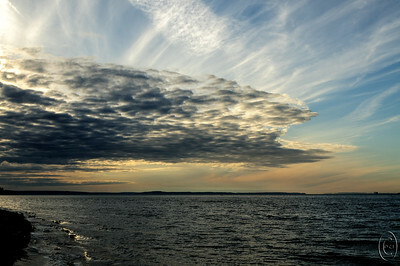 The base image was given a very slight micro contrast adjustment to bring out the clouds and that was it. Nikon D300s; 18 - 200; Aperture Priority; ISO 200; 1/400 sec @ f / 9. 26 Jul 16. 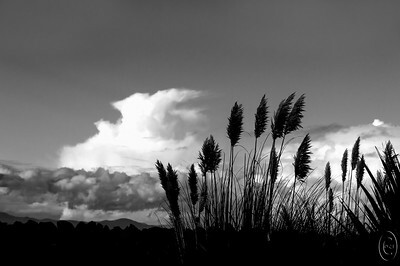 My B&W efforts for today failed so I'm going with a straight version of the subject. The lavender farm that I love for poppy shots was as I mentioned yesterday a great disappointment in that all the poppies were long deflowered, but the seed pods were in excellent shape. Only there weren't very many to work with, so the normal opportunities of having them abundant throughout the fields were missing leaving only a few of the pods along side a couple out buildings. This grouping of roughly a dozen were near a display building that looks as though it hasn't received any attention in about a decade. 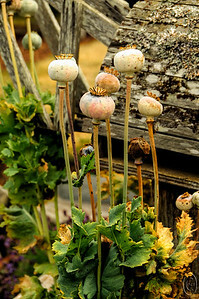 They are growing next to a birdhouse that sits behind a decorative windmill which, if you catch it during the full bloom of the poppies, is generally very attractive. On this trip all that remained were the seed heads (pods.) You could crop off the bottom half of this shot right at the juncture of the two pods and base of the bird house on the lower right and have another image that just features the pods, but I felt that the bottom with the leaves provides a more complete representation of how things looked. If you wait until the stems and pods are mostly brown before cutting them off near the base of the plant you can make a nice rattle. This is pretty much straight out of the camera. Nikon D300s; 18 - 200; Aperture Priority; ISO 200; 1/400 sec @ f / 9. 27 Jul 16. If you use the M$ operating system you likely have seen at least one piece of "wallpaper" featuring vast fields of lavender that seemingly go on forever. 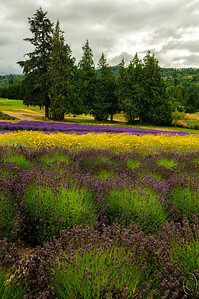 That is something you won't see at the Sequim lavender farms as none of them come even close to being of that caliber. But the lavender is still planted in rows and is still just as lovely. This year I was surprised to see another flower planted among the lavender and while I didn't inquire about - I should have - I think it may have been planted just for contrast. My thinking it was not planted as a competing crop is based on there being far more rows of lavender than of the "color" crop and only a few of the fields contained the "color" crop at all. Those that did however were truly delightful and I hope they do it again next year. You can judge for yourself as to the effect. It was present in the first lavender image I shared but in this composition you can get a good feel for the difference in the two flowers and how the plants are arranged. The smaller green clumps, diagonally upper right, are young lavender plants and will likely be used for the cut your own area next year. I cropped off the top 1/3 of the capture as it added nothing and was quite distracting and cloned out a few remaining annoying items (chairs and people) but otherwise this is a straight shot. Nikon D300s; 18 - 200; Aperture Priority; ISO 200; 1/640 sec @ f /10. 28 Jul 16. Something entirely new for this week's Theatrical Thursday. I'm definitely not a fan of modern art, but while playing around today trying to decide what I'd do creatively I came across a filter called impasto fingerpaint. 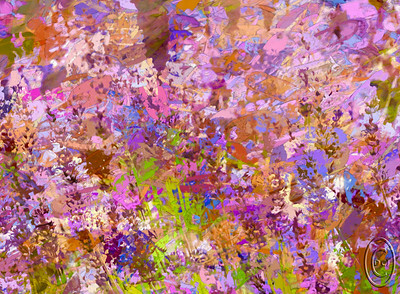 My plan was to create something clever using a shot of lavender filled with buzzing insects. Wherever we went last week lavender-wise the plants were simply swarming with bees, primarily honey bees but bumble bees were also well represented. I was planning on doing something to emphasize the honey bees, but all of my attempts did not produce anything I liked. That's when I came across this filter and I immediately thought of creating something along the lines of paint splashes to represent the scene. Not sure if "Modern Art" is the best moniker, but much of this type of artwork that I've seen has been put in that category rightly or wrongly. In any event, the resultant image after passing it through this filter struck me as rather cheery and definitely summer-like so I decided to go with it. My gut feeling is that this will be either a love-it or hate-it type of image. The base image was severely cropped, given some contrast adjustment and run through the filter Impasto Fingerpaint. Nikon D300s; 18 - 200; Aperture Priority; ISO 200; 1/100 sec @ f /10. 29 Jul 16. Having reviewed the material from the creative macro photography class I just completed, I formed the opinion that it should be a piece of cake since I've been shooting macro stuff since I began taking pictures. Went to the local fabric store and got about a dozen colors of tulle - almost broke the bank at $0.33 per color - and set off Wed to shoot dahlias at the local display garden in Silverdale. For those of you in the local area who like shooting flowers and dahlias in particular, the display garden next to the post office is quire nice and all the plants are easily accessible and you are welcome to shoot there. With lots of flowers in the red hues available, I wrapped my piece of pink tulle around my lens and prepared to enter into a new world of photography. Whoa, not so fast, it would seem that things aren't exactly as presented in the training materials. After about 15 minutes of pure frustration with nothing working according to Hoyle, I gave up, reverted to what I knew how to do, and simply employed that part of the training that I fully understand. So in some rather hot conditions, somewhat reminding me of several flower shoots in MD, I proceeded to work on capturing macro images at wide open apertures and very close focal distances. Relying on my trusty 105mm macro, I focused on only a small portion of the flower and let every thing else go soft. After trying that a couple hundred times, I decided it was time to review back at home to evaluate my approach. Much to my delight, I got perhaps a couple dozen usable images which was not bad considering the temp, time of day, and windy conditions. I attempted to work with 3 different lenses, but only one was useful. So now it is time to pull out a lot of older closeup attachments and see what combinations I can come up with to achieve the desired results. Plus likely a fair amount of time in the "studio" learning the cloth over the lens techniques. 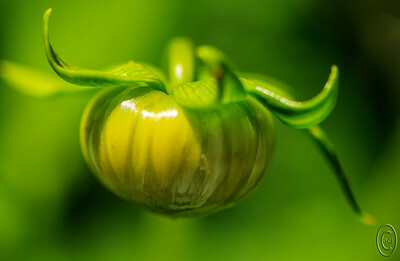 This shot is of a dahlia bud that was arching over and appearing as if it had come out of no where. The sun was very bright, reflecting off a portion of the bud, and without a diffuser to soften it I had to take what I could get. 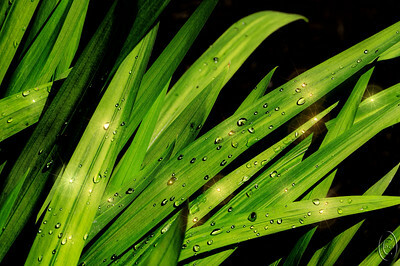 The focus point was on the leaf in the upper left hand portion of the frame. I cropped the image a small amount and backed off on the white level some to counteract the bright spot on the bud and that was it. Nikon D300s; Aperture Priority; ISO 200; 1/600 sec @ f / 5 with the 105mm macro lens.